We would like to take this opportunity to wish everyone a very Merry Christmas and a happy and healthy new year. Over the Christmas period when everyone is so busy, we have a challenge which will last for the next two weeks. Lots of you may have noticed that on some blogs, Blogger has decided to add a 'Prove you're not a robot' feature. In fact it is not necessary to fill in this box with the numerals indicated. For many, Word Verification is turned off and to alter the settings sometimes causes other problems within the blog, so don't worry and please leave your comments as usual and even without filling in the anti-robot box your comment will be published. I'm sure that everyone would like to join with us to wish her all the best for the future and to thank her for all her wonderful inspiration since she has been a part of the Less is More team. No stamping! Memory Box deer dies, Sheena Douglass embossing folder topped with a Simon Says diecut snowy slope, computer generated sentiment. The sentiment was computer generated in Architect's daughter and Love is a many complicated thing. 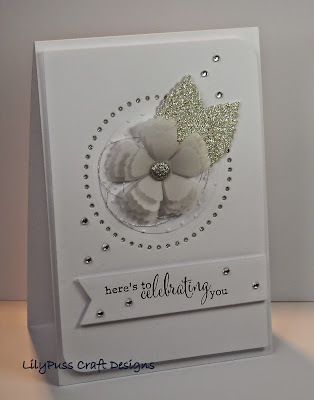 Just wanted to pop in for one lst challenge to thank you for being part of my crafting family.... 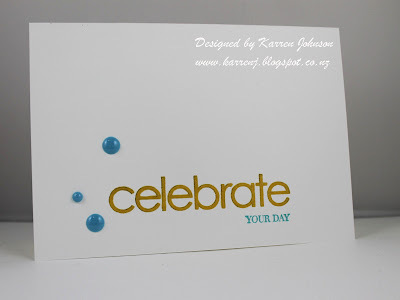 I have made a little celebration card for today's theme. 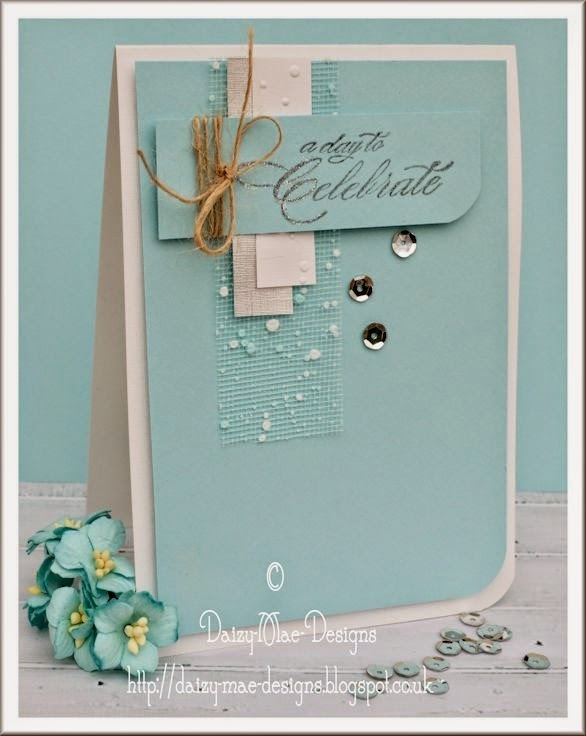 I have used a cute Tiddlyinks Image and a sentiment from Clearly Besotted for this bright fun card. To thank you all for your support over the last few years I have some candy on my blog for my LIM family. 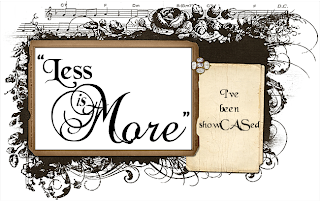 All you need to do is comment on the Less Is More post for this challenge!! 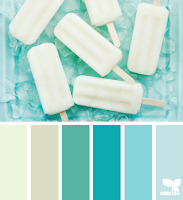 From us all at "Less is More"
This was our inspiration for this month's colour challenge and what beautiful cards emerged. 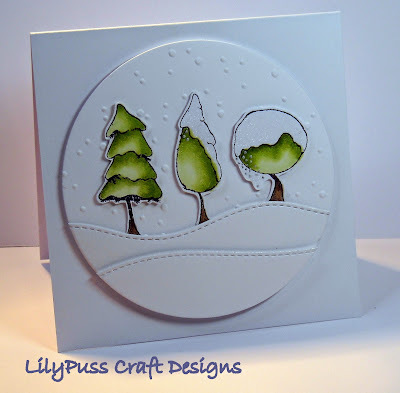 What an amazing backdrop for this simple die-cut, the colours look wonderful! 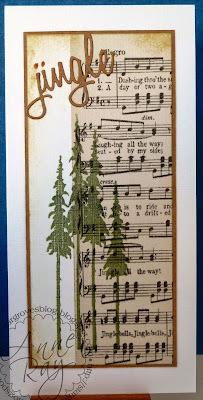 What a beautiful inked and stamped scene, framed by the pelmet of branches... just lovely! Another beautifully created backdrop for these bold flowers...gorgeous! Please take our showcase badge, with many thanks for the inspiration your have provided! Do join us again tomorrow , our next challenge will run for two weeks, to give everyone a breather over the Christmas period! 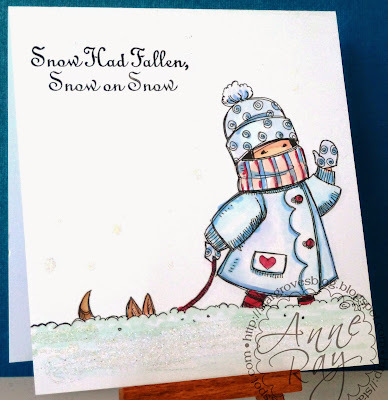 We have another One layer Challenge for you today. 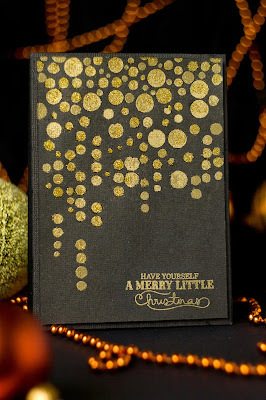 Your last chance for those final Christmas Cards should you need them! Here are our cards to give you a few ideas... not that you will need many! Here is a little snowman from Dearie Dolls digi images. 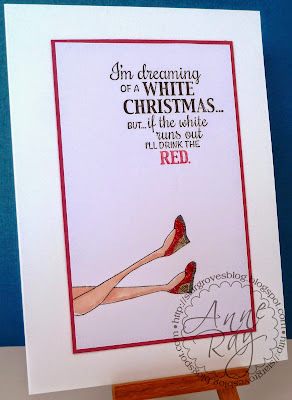 Simply coloured with Mirage pens and twinkled with a little Glamour Dust. The font is Love is a many complicated (thing) I presume! 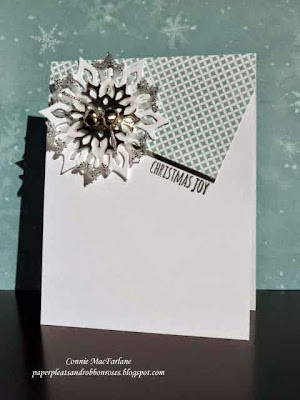 are heat embossed in white then inked with Peacock Feathers Distress ink. and to finish some turquoise pearls from my stash. 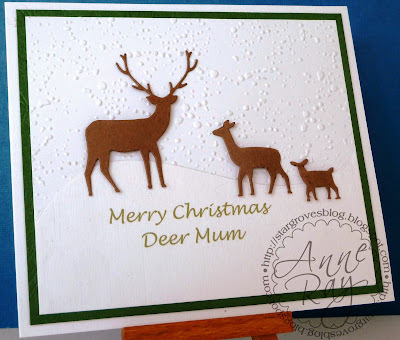 As ever, each of us has a few extra cards on our personal blogs so we'd love you to pop by and pay us a visit too! If you're not sure of our rules for one layer cards, do look at the guidelines on our side bar. 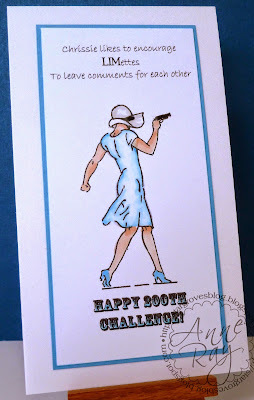 It was lovely to receive so many good wishes from you on our special 200th challenge. We couldn't continue without your support, for which was are most grateful! Such elegant simplicity and perfect placement! 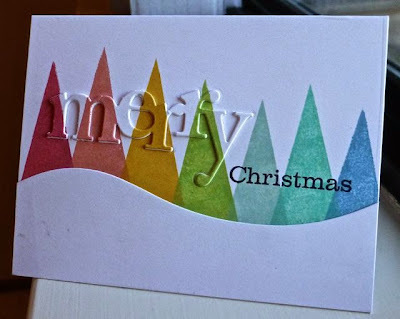 Glorious colouring and such a fun simple card! Here is our showCASe badge for you ladies! Please take it with our thanks. We hope you will all be back tomorrow for our new challenge! We would like to thank everyone for their kind comments about our 200th challenge last week. We were so happy to hear how much you enjoy our challenges... we certainly enjoy seeing all your fabulous creations. Now we have a new month, a new challenge and of course, a new sponsor. 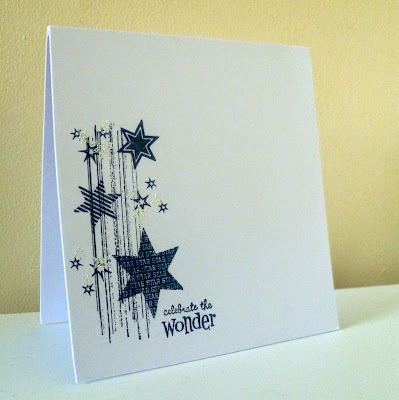 All JOFY stamps, embossed with WOW powders. 'Baubles' added to the wreath with Stickles, Perfect Pearls and Glossy accents. 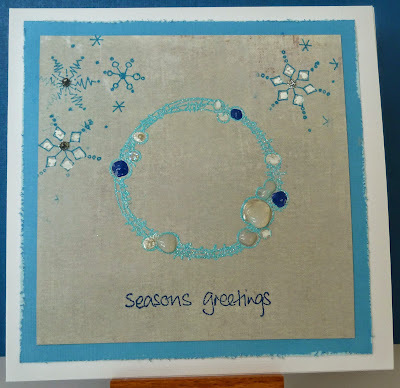 I thought I was really clever to mix my own embossing powder with blue and sparkle. But when I put it back in the drawer I had some sparkly blue in there already - doh! I love this stamp of wading birds from The Stamp Gallery. I stamped the birds and then used Elmers Rubber Cement as a mask to keep them white, whilst I inked the sea around them. I assembled a few ink pads matching the Design Seed colours and with a mask ripped from a Post It note added the colours for the sea. 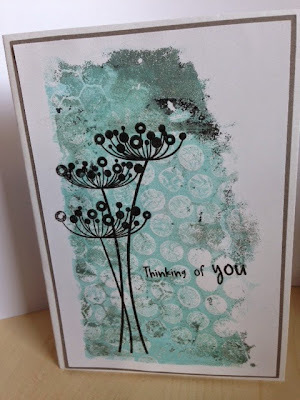 I then overstamped with SU Gorgeous Grunge broken lines and then added a few random dots which I embossed with white EP. with gems from my stash. We hope you enjoy this one... they are gorgeous colours aren't they! Here are the fabulous showcase choices for this week...what a jingling joy it was to choose! 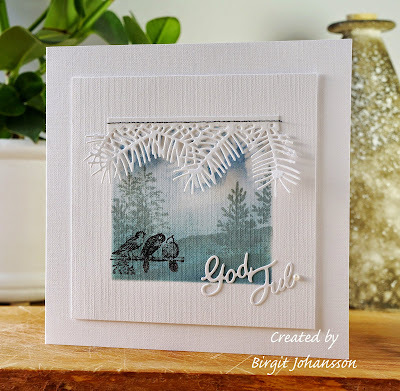 Darnell writes such fun posts and make wonderful creations... we just love her lines of jingling bells. 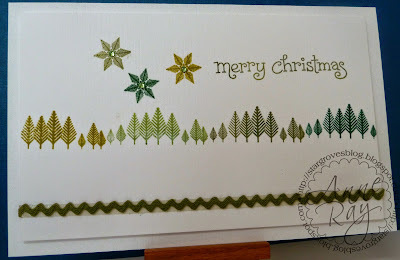 What a feast for the eyes this beautiful card from Connie is! 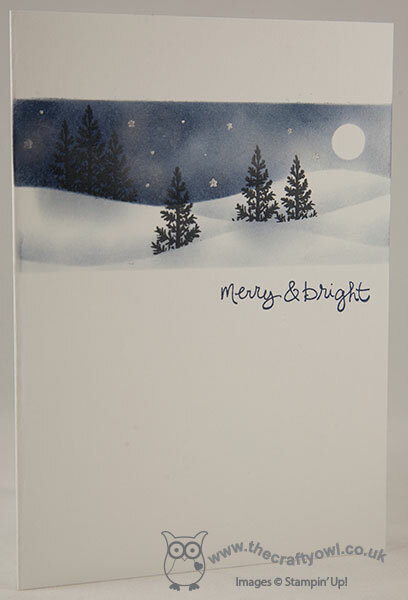 All of these cards, really showcase the CAS style... lots of white space, beautiful elements. Tomorrow there'll be another challenge, so do come bakc and join us!